For my first game jam, my goal was to make a point and click, like the ones I played when I was younger (Broken Sword, Monkey Island ... yes I'm old). I don't have a name right now, but the main character will be Inspector Waffles. 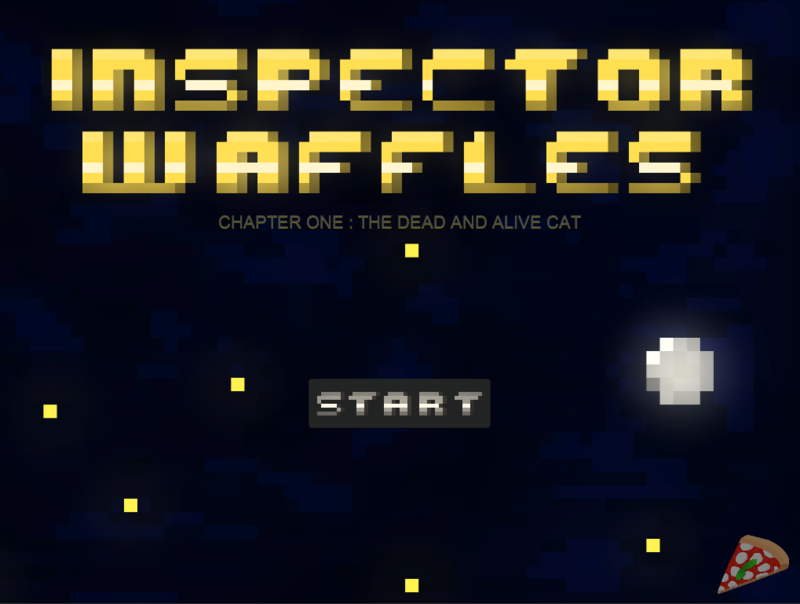 I'm already working on an other game (check my Twitter if you are interested), so Inspector Waffles is a side-project. My goal is not to finish it in 2 weeks, but at least to make 2 or 3 scenes. I like the idea of the 2 weeks duration to make something working at the end of it. I'm also using new softwares I got from the Humble Bundle (Hexels, SpriteIlluminator). I'm very satisfied of both of them at the moment ! Inspector Waffles is an old school inspector, spending his spare time in bars. One night, a very rich cat is finding dead outside his house. Inspector Waffles is called to find if he kills himself or if he was murdered. I wrote a couple of scenes, probably 20minutes of gameplay. The hardest part was setting up the puzzles, not too easy, not too hard. I'll probably change some sentences during the jam, but it's almost done. I am not a pixel artist, so I'm quite satisfy with the result. I've planned to do 2 other characters, but I won't have the time to make crazy animations I guess. The body was found in front of a big house. I did a background, but I'm not satisfy with it at the moment, I'll probably change a couple of stuffs (too narrow in my opinion). Nothing at the moment. I'll start today or tomorrow. I'ld like to do some talks between characters first, and then finish the first scene : it's going to be a "cinematic" scene, where there is almost nothing to do, any aspect of the point & click game mechanics. Ohhh man, I really like the first scene's background! It really gives off a mysterious atmosphere. I'm a sucker for not only point and click adventures, but also mysteries, so you can bet I'll be checking back on your devlog to see how things are going. I can't wait to see your progress! The art looks great so far! I'm always on the look out for whodunit games, can't wait to see more! I love your art style! It makes me think of games like Ace Attorney and Ghost Trick, even though it is not the same. Whoa, this is... pardon the pun... my jam! I'm interested to see how this turns out. Thanks ! :) That's ok, game will have a lot of puns about cats and dogs. It's very nice! I love a good murder mystery. Just out of curiosity, are you making this in Adventure Game Studio, or a different engine? Thanks ! I'm using Unity. On my next post, I'll explain all the softwares I'm using for this game jam. Drawing is almost done, I just need to do a couple of animations (shining stars and blinking lights for example), for me it's a little bit too static. I added character animations, I used Spriter to do that, and the result is pretty good ! This software looks promising. You can also see the first dialogs between Waffles and Patches. Next, I will add the interaction between scene and mouse clicks. I made a little dialog system between 2 protagonists, launching animations and showing conversations. Tomorrow, I will add interaction between the mouse pointer and scene objects. If I have time, I'll make the inventory (I already left empty space behind the scene). ahhh man i love old style point and clicks. i love the style of this so far--it looks really awesome! Today, I did what I wanted to do : cursors and inventory ! You can now interact with some objects from the scene. A description appears and Waffles says something about it. The cursor changes from a cat's paw (I hope you like it !) to a magnifying glass if you are on a "special" object. I'm not sure I'll add other kind of cursors, but I will add a lot more of selectable objects to this scene. Tomorrow, I'm going to add the interaction between the objects from the inventory and objects from the scene (putting the polaroid picture into the trash can for example). And if I have time, doing another scene or polishing this one. This is shaping up really well! This is looking really good :) I am loving that pixel art, can't believe you were able to do so much in such a short period of time. I'll keep an eye on Inspector Waffles. Thanks :) And thanks to Hexels, this software helps me a lot to do it faster than I was expected ! May I ask how hexels helps you to do it faster? I got it as part of the recent humble bundle, but haven't really gotten around to play with it. I got on it on Humble Bundle too, and I do this Game Jam mostly to try these new softwares. I think the palette is easier to use, it's a faster way to draw : you have only one image on your canvas, you can add some glow easily ... I didn't try animation for now, but I guess with only one tile, it could be harder. I used PyxelEdit before (still using it on my other project), and I think I will use Hexels when I want to do animation with Spriter (like in Inspector Waffles). I forgot to mention that you can draw with a lot of different styles in Hexels : not only pixel but hexel, trixel, mosaic styles ... For an isometric games, with trixels, it will be so great to do it with this soft. Loving the pixel art here. Bobbing head animations too! How on earth will you get this done in time though? Seems a lot of assets to create. I would say it's 4 hours / day on 3 days, mostly drawing. I spent 2 hours max on programming, there is not a lot of codes at the moment. I drew one cat, and the other cats are very close to the others. The map took me a lot of time, but I knew before starting the jam how the house would be. The polaroid took me one hour, maybe two. And thanks for the feedback ! Today I didn't do all I wanted to do because I released a new version of my main project (if you are interested, check my Twitter account). I did only 2 things on Inspector Waffles, but there are 2 important aspects of the game : interactions between the inventory and the scene, and multiple dialogs. You can select item from your inventory and try to interact it with the scene. Item is not highlighted when you select it, also when Waffles is talking. I didn't test the "combine" action between 2 items because ... I didn't draw an other item :) But it should work ! When you click a 2nd time on the corpse, new dialogs appear. I had to make a dialog system : according to what you already said and what you have in your inventory, dialogs change. Tomorrow, new scene ! It will be a 100% pixel drawing day. I will probably draw new items too, and testing the "combine" action. aaa it's really awesome that you've been able to program the inventory + dynamic dialogue mechanic! this i love the cute little paw cursor ahah. great work! i did a point and click inventory + combining system one time and used an array of compatible item indeces--not sure if this is useful to you. looking forward to seeing it! I said this in the Discord chat earlier but again, I really love the looks of this! I'm excited to see the progress of this very much, it's looking great so far. Today I saw Rogue One and it was awesome ! And I did some game dev too. This is the bedroom inside the house you have already seen. I wanted to add more details, but I won't have time to finish the game if I am polishing too much, so he will stay like this, I think. This is also how it looks like into Unity, if you are interested about how some aspects of how the game work, let me know ! Now, some elements from the scene can move, appear or disappear : they are seperated from the background and can be updated according to what you do with Waffles. See the exemple with the painting of Meowgritte (I hope you like the pun, because I will add more :) ). It's not obvious to see where are the moving objects and the static ones, and I am quite happy about this ! Also, the windows are really weird on the GIF and their pixels change (it's only in the GIF). Tomorrow, I'll add the mechanic to go from one scene to an other, and I think it's going to take some time. Probably doing some pixel art too, if I can. Today, I did a new scene and Waffles can move from one scene to another. The hall is the first room you meet when you come inside the house. Not a lot of things to show, only 3 doors which lead to other rooms. Waffles can go from one scene to an other, without losing his items. I've added a new cursor (with a door), which let you leave your current scene. Changing scenes with Unity was not so easy (I met a couple of problems I didn't expect), but it's done ! New scenes, new decors and new items ! I have to do a lot of that before starting the interrogating part ! aaa the moving images/sprites add a lot of character and a feeling of interactivity to the scenes--looks good!! 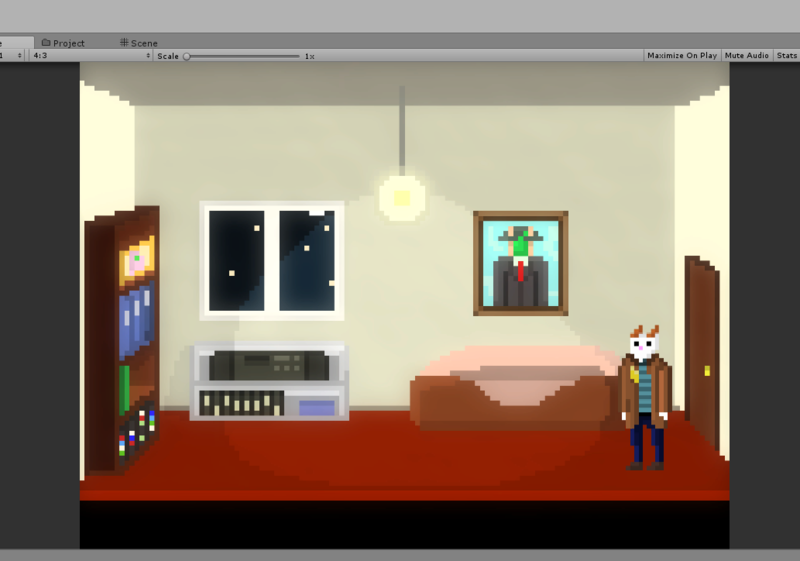 I've also added a saving state from one scene to another : if you moved the painting, for exemple, and you come back into the same room later, the painting will be at the same state you left it. That's a huge progress for the game. I have one week to finish, and I need to do at least 3 scenes, maybe 4. I would like to start the game with a cinematic, no idea if I will have time to do it. And I still need to start the "interrogate" part. It's going to be fine :) Today, I will draw a new scene again and start to test the game, solving my own puzzles (I think I can solve them ;) ). 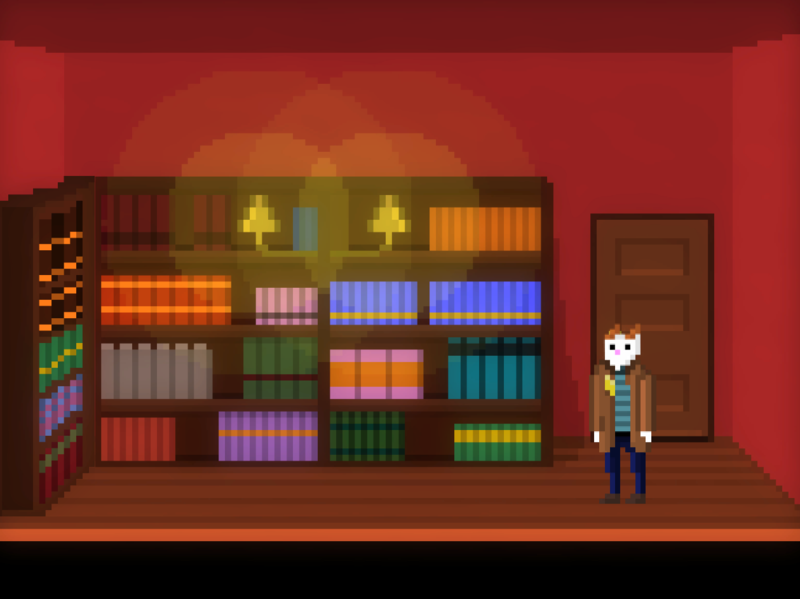 Today, I've added a couple of items, one door you have to unlock, and a new scene : the library ! 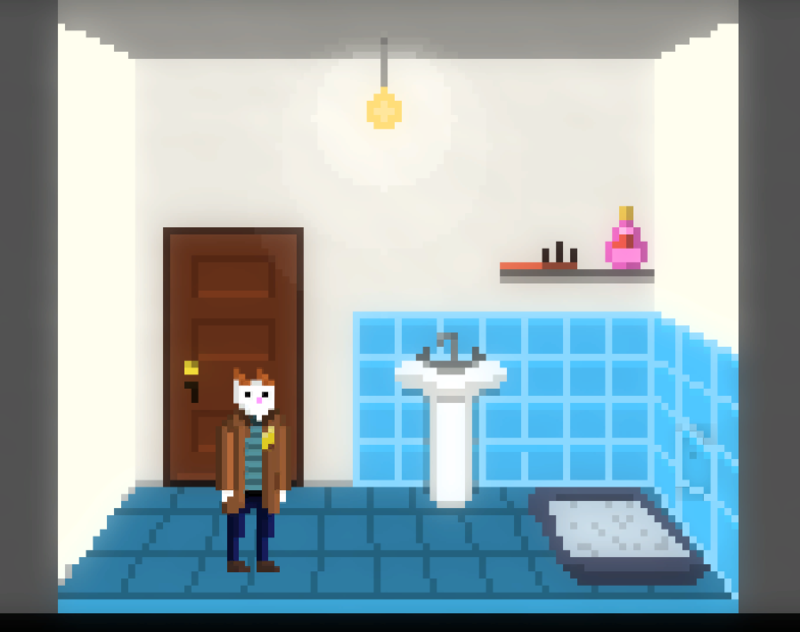 I need to do 2 more scenes to complete the house : tomorrow, again, it will be a pixel art day ! Yesterday I tested the puzzles from all the scenes I have already done. And it works ! I have nothing to show unfortunately. Outside/Library/Hall and Bedroom are done at 90%. I just need to have some details on other decors, it will add depth to the story. 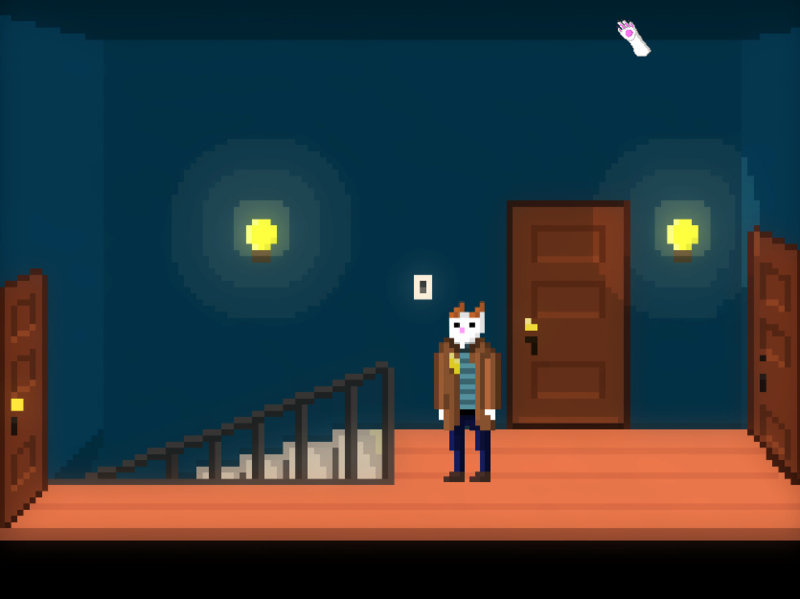 You can combine your inventory items with doors, objects,people : changes are visible on the scene. Most of the point&click aspect are done ! That's a real relief. I'll probably have time to start the interogate part. I need 2 more scenes for the story, 1 for the interrogate part. My goal is to finish the story before Thursday, and try to do the interogate part before the submit. congrats on finishing up the point and click mechanics! i'm kind of curious about this interrogation part--is there some kind of dialogue options to it or is it still pretty adventure-y? the lighting in the last picture looks really lovely. 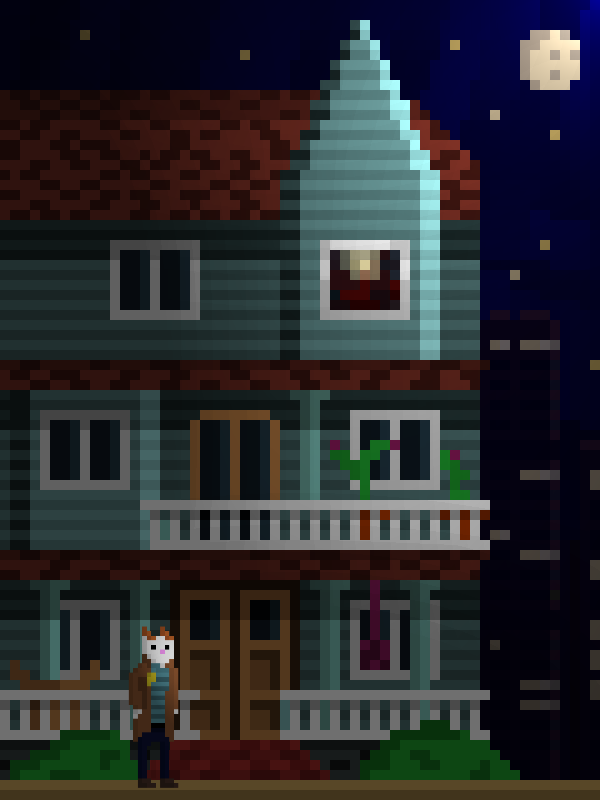 And thanks for the light, Hexels is a really cool tool ! 2nd floor is done. I have a little room to do on the first floor, and it will be all done ! I just need to make an other scene for the interrogate part, if I have enough time. We are almost at the end of the jam, and well, today I didn't finish what I wanted to do and I want to sleep :D. Tomorrow is going to be a long day ! The bathroom is done ! It's not significant for the game because you can access to it at the beginning of the game, so I'm sharing it with you :) Also, it's very simple because, well, I still have no time for polishing ! I add a lot of new interaction with the other scenes : most of them to start a story and understands the world, Fluffy history and hobbies, working relationship between Waffles and Patches and so on. Thanks again for your feedbacks, and good luck to finish your games if you are part of the jam ! Very short devlog for today. I spent my time testing the game and trying to crash it. I just need to do a short end for the game, just before the witness interogate scene. As I expected,unfortunately, there won't be any witness to discuss with : it would be crazy to start the interrogate part now and try to finish it in one day. Too much UI, pixel art and coding to do. Maybe later, if people like the game ! I will also add the talk action, but it will be accessible only for one character : Patches (the other cop). See you tomorrow for a final devlog post !